The NDEx Project | Welcome to Dr. Chen! The NDEx Project is happy to announce that his Lead Software Engineer, Dr. Jing Chen, has officially joined the NDEx Development Team on a full time basis! 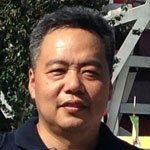 Dr. Chen has many years of experience in software development focused on the integration and management of life science data. Prior to joining the NDEx Team, Dr. Chen worked at GeneticXchange Inc. and participated in the UC San Diego CAMERA project. Curious to learn more about the other NDEx Team members? Head over to our website and check out the "Meet the Team" page!